Željko Babic, Croatian National Handball Team Coach, whose team won the bronze medal at the recently held European Handball Championship in Poland, came to Medjugorje on February 4, 2016, so he would thank the Queen of Peace for all of the graces he received. He first met with Fr. Marinko Sakota, the parish priest and then he gave an interview at the radio station Mir. Babic spoke about his experiences in Medjugorje and about the importance of faith and role of Our Lady in his life: „I’ve been coming to Medjugorje since 1997. It was on one occasion that I received the huge gift, gift of forgiveness. I started to grow closer to Our Lady and my life was gradually changing. 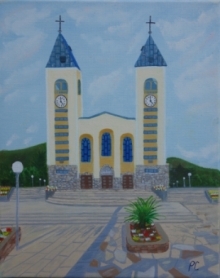 I would always leave Medjugorje with a special joy in my heart. I feel desire to thank Gospa for all of the help she gives me in my life, regardless of the professional success or absence of it. I would come to Medjugorje even if we did not win at the end”, said Babic. When asked what would he recommend to the other listeners, he spoke about prayer of Rosary, Holy Mass and confession. Just a reminder, it was this coach who publicly spoke about Medjugorje in the first interview after very important match with Poland and Croatian victory and he said how that victory was a miracle from Medjugorje and he thanked Jesus for what had happened. It was a public testimony of his faith: „I only shared what was in my heart. I am trying to live Our Lady’s messages as much as I can, and that should not be anything amazing. We, Croatians, always prayed to Our Lady and loved Her. Blessed Virgin Mary is in my heart, She is helping me and I would never strike that out, but I felt I should say it like I did, publicly. Each time I come to Medjugorje, I feel great love of God, I am able t go for confession, to seek for help from Gospa and Jesus, all with purpose of becoming better person.” Babic spoke about the European Championship in Handball: „Poland was a great experience for me and for my players. Those young players performed extremely well and their love for Croatian team and people was so evident. Winning bronze medal was great reward and encouragement for all of us, regardless of who played or who trained the team. It gives hope and proves that good work and renunciation can achieve the impossible. I already said that medal is something supernatural, it is God’s miracle. I do not know why we were given such inspiration while we played nor whether that would happen ever again. I cannot and do not want to think about that. I, as all others, am a witness that true miracle took place there.” Our handball national players confessed prior to the European championship and received the blessing before their trip to Poland.